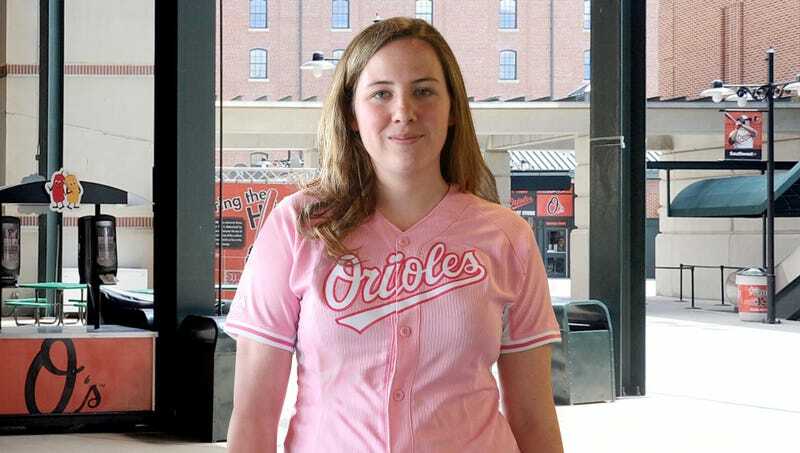 BALTIMORE—Marveling at her ability to shed so many preconceptions and societal norms, sources confirmed Tuesday that the pink Baltimore Orioles jersey worn by local 27-year-old Kelly Fournette undoubtedly shows that she is a sports fan, yet at the same time also maintains her femininity. “It is clear that this woman enjoys the sport of baseball, but the fact that her jersey is pink and not, as one would expect, orange and black, reveals that she still retains what would generally be considered traditional feminine qualities,” said onlooker Gabrielle Walters, adding that Fournette’s deft navigation around conventional gender roles was only further evidenced by the name “Mrs. Machado” emblazoned on the back of the baseball jersey above a lavender-embroidered number 13. “Here is a woman you can picture kicking back with a few beers at the game alongside several of her male friends, but just as vivid is the image of her waltzing at a gala dinner while wearing high heels and a beautiful chiffon gown. I wish I could walk such a fine line, but alas, my jersey merely features the standard home colors of the team.” Sources added that the jersey worn by Fournette’s boyfriend, which bore his own last name on the back as opposed to one of the players’, illustrates that he is a devoted sports fan who understands the importance of preserving one’s own sense of individuality.